Swagbucks is not worth it if you want to make any real money online equivalent to your time invested and let me tell you why. It's legitimacy and safety will vary in opinion from user to user but that goes without saying for nearly any similar system such as Swagbucks. On this blog, we tackle common themes associated with blogging no matter what kind of blogger you are. One of the topics that people want to hear about are methods to make money. However, in the same arena it’s helpful to talk about the methods that are worth avoiding too. Time is precious folks and no one’s got time to waste time. Money is a common theme online and offline and today we’re going to focus on Swagbucks. With that said, many want to make money online.. including me, other bloggers, people in general with a website and even you.. but Swagbucks isn’t a realistic way to reach that goal. Swagbucks doesn’t even come close to representing a tangible route to making a part time supplemental income. Pocket change is probably the best way to describe what I’m getting at. There are sites in their reviews that do say as much or may even imply that it’s not worth your time but those are in the minority. Of course, on the flipside there are others that would rather get your referral click. The sites that would rather have you discover the truths I’m laying out for you here on your own and those aren’t that hard to spot either. This can be seen by simply doing a Google search for Swagbucks review but be warry of claims where you’ll make thousands of dollars via Swagbucks. That’s not to say no one’s ever done it, but that’s akin to finding a unicorn if you get my drift. However, even with that said, in all transparency.. it’s not all bad news. The savings are better than the money making opportunities so it truly depends on your goals, intent and purpose in your activities on the Swagbucks website. Consider this tidbit of inside information as food for thought.. 1 Swagbuck at the time of this post is equivalent to .01 cent. When their currency and dollar equivalent looks that lopsided, how much work are you going to have to invest in completing activities to earn money to make it worthwhile ? In the “answer surveys and earn” section of my Swagbucks dashboard, an opportunity that is listed is for me to complete a survey. Time to complete the survey is 20 minutes to earn a whopping 80 SB’s. That means I’ve given them 20 minutes of my life to earn less than a dollar ? Where’s that scratching my head emoji when I need it ? Let’s take this a bit further and assume that they have given you 5 different survey opportunities to complete 80 to 100 Swagbucks a piece. Assuming you’ve completed all of them, that’s nearly 2 hours of work for maybe $5 and some change. If we do the math here, your hourly rate for that work is a little over $2.50 per hour. Even if we adjusted our numbers a bit here in this scenario, you’re still on the poverty level in hours worked vs compensation received. I don’t know about you but there are far more efficient methods to earn a buck than to spend 20 minutes filling out a survey to not even make a whole dollar. Conceptually though, this website sounds like it’s got potential and I want to give kudos to the “idea” behind this website. However, with respect to fairness for the end user (e.g. you and me), Swagbucks is getting the lions share of the money where the rest of us are just slaving away on activities like paid surveys for little to nothing. Here’s a video that digs into the numbers and earnings potential in even greater detail. It may sound like I’m being hypocritical here considering what I said in the beginning of this post from a referral link standpoint, but I’m going to say it anyway. Ebates is a far better option and yes I’m an affiliate. I'd even go as far as saying Mr. Rebates would work out better for you too. So why mention Ebates as an alternative ? Where Swagbucks has you do all the hard work for their own currency (and yes I get that you can work for giftcards too) or little to no real money at all, here’s where Ebates is far better for one substantial reason. The entire site and concept is cashback driven. It’s about sharing the commissions they get from the money you spend and giving a portion of their commission earned back to you. If they make money, they are going to share it with you. It would make far more sense for Swagbucks to invest in more of a reasonable percentage driven revshare program that’s more equitable than their current system but that’s just my two cents. Nevertheless, on Ebates.. we’re talking “real dollars” and not this reportedly “deceptive” Swagbuck currency. I say that because 100 Swagbucks looks like a big deal until you learn that it’s basically .01 cent. Talk about disappointment ! Needless to say, Ebates may sound too good to be true, but I can tell you that I’ve personally experienced their cashback system and it works well and it’s cash.. not Swagbucks. Ebates is also seemingly much more straightforward than Swagbucks as well. If you’re a blogger or referrer that offers Swagbucks to your visitors as the place to go as a method for earning money that’s certainly your call. I just don’t agree that it’s worthwhile for anyone. 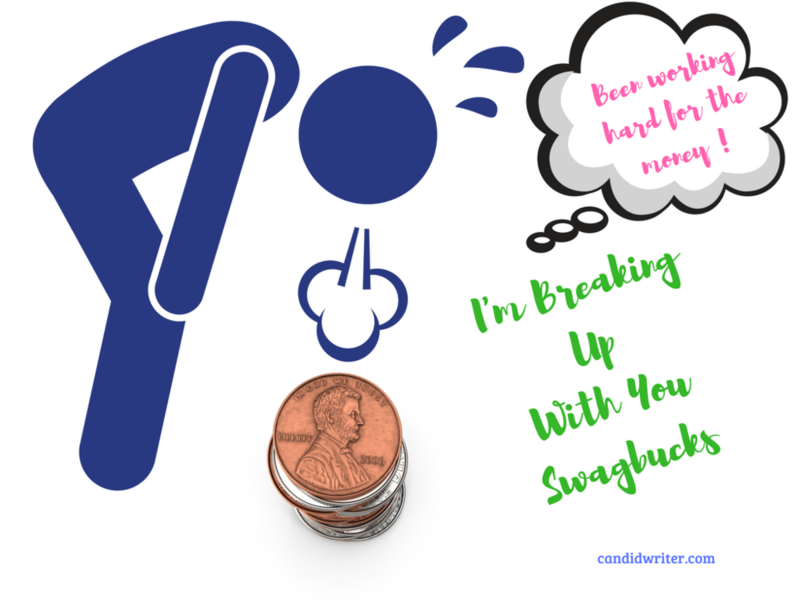 Swagbucks is simply not worth your time when you consider time and effort invested equating to what you get back in return especially if your goal is to make money. However, as I said in the start of this post, it’s not all bad news either. In spite of what I’ve said you may still feel like, hmmm… I’d still like to give it a try and there’s nothing wrong with that either. Swagbucks is not a cashback only type of online destination. Their focus is more widespread as they do offer a myriad of ways to earn Swagbucks on their website. They even provide discounts that still earn you their site currency. With that said, I know that as bloggers we are always trying to share new money making opportunities to our visitors and I’m no different in that respect. That goal remains the same whether you’re a blogger that blogs about food, fashion, tech, family or other niche. We’re always trying to share something worthwhile with people that take an interest in our content. However, when it comes to this particular topic on Swagbucks, no matter what I’ve read even considering all the money they have paid out to the fans of their system and site, there are better alternatives to it. I say this in regards to your time, earning potential and goal to make money online whether you still elect to try out Swagbucks or Ebates as an alternative or some other method you may have come across as well.